Tranquil House B&B @ 1 College Avenue - Queenstown Accommodation. 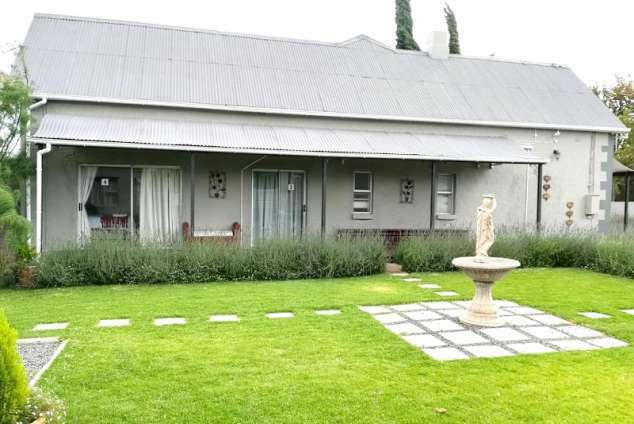 The lavender gardens creates an atmosphere of tranquillity and our bedrooms comprises spacious rooms each with their own private kitchenette, private entrances leading to the tranquil garden setting with a pool and braai area. This setting does justice to the name Tranquil House and it provides for luxurious and tranquil accommodation. Our guests won’t get left in the dark during load shedding or that very annoying protracted power outages, a standby generator will power all ceiling lights and television sets. We also have a gas operated geyser for each room to ensure that no one ever goes without hot water should we have an interruption to the electrical supply. .
On the menu we offer both dinner and breakfast. Our mouth watering traditional cooking is served generously and accompanied with gracious hospitality. In the morning both an English and Continental breakfast is served. Dinner must just be booked before 13H00 on the day of check-in. 16887 page views since 20 Aug, 2010. Last updated on 04 Dec, 2018.